This view is, in a way that of St. Luke's Hospital, whose motto, "Corpus sanare, animam salvare," makes of almost equal value the work of curing the body and of saving the soul. This linking of the two ministries, without any sort of sectarianism in the spiritual one, has been the feature distinguishing St. Luke's since its foundation, although now, in its new quarters, it adds to this characteristic others as peculiarly its own. For in­stance, it is today the most complete hospital in this country, and probably in the world, in the sense of being the most scientifically constructed and the most carefully adapted in all its appointments to its needs. 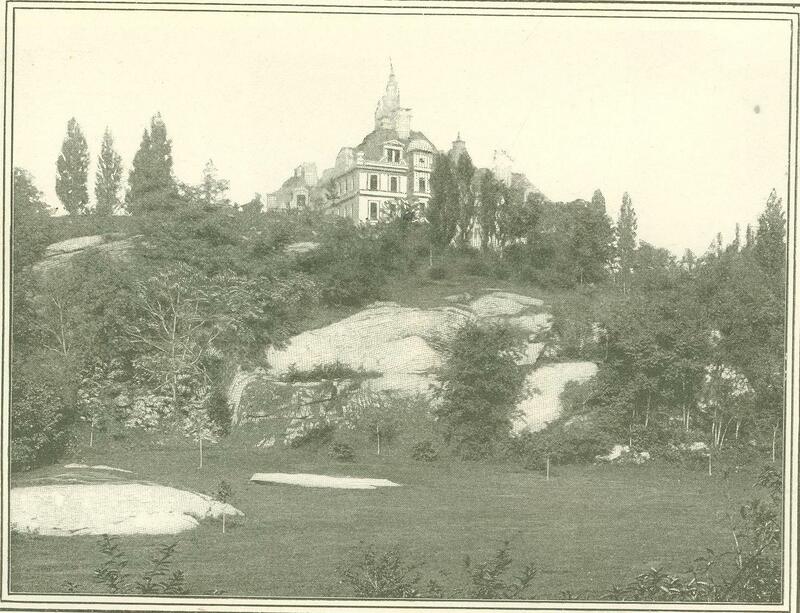 It is difficult, moreover, for a New Yorker to conceive of another hospital so beauti­fully situated. Nowhere else in all the great city do winds blow so freshly or so sweetly, fragrant as they are with odors from the miles of neighboring parks. Nowhere else is there more quiet. 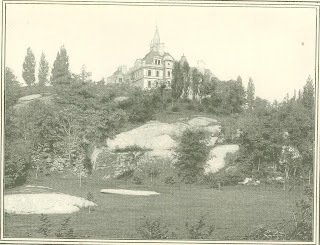 The roar of the elevated is lost below the Morningside cliff. The Amsterdam Avenue trolleys, which bring the hospital into close con­nection with the heart of the city, whirl by in comparative noiselessness on one side of the building. There is little traffic in the neighborhood, and altogether no equally central situation could have been chosen where less of the city's roar could penetrate. St. Luke's is a collection of semi-de­tached buildings, connected by passages in such a way as to present an external appearance of unity. When the entire building is completed, there will be nine of these buildings. Five are already finished, and the rest are to be added as the need of them arises. The front of the hospital is on One Hundred and Thirteenth Street. The central building facing the street is known as the Administration Building. West of it is the Norrie Pavilion, while to the east is a similar pavilion called the Minturn. To the west, on the One Hundred and Fourteenth Street side, is the Vanderbilt, and to the east the Private Patients' Pavilion. The Administration Building is entered by a deep, broad, semicircular driveway, at the inner edge of which is a pillared approach for pedestrians. It contains the central tower dominating the whole group, and it communicates with the four pavilions by en­closed diagonal passages. Where these passages pass from one building to another there are open arches on each side, giving what are architecturally known as "fresh air cut offs." These insure the free circulation of light and air on all four sides of each of the pavilions, and, what is no less important, they absolutely pre- vent the direct circulation of air from one building to another. The arrangement of the wards approaches the ideal of physicians and architects. 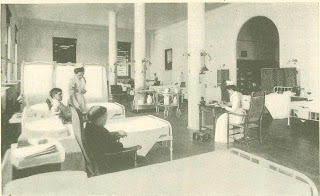 The requisites of the perfect ward are said to be: such a location that the sun can freely enter windows on three sides during different portions of the day; the greatest possible amount of southern exposure; natural cross ventilation from north to south and from east to west; a complete circulation of air around each ward, with all its dependencies - which means the nurses' rooms, medicine rooms, linen closets, and the like; no possibility of direct communication of air between any, two wards by means of corridors or shafts; proper space for the ward depend­encies; possibility of complete isolation of certain wards; and at the same time with all these, the possibility of easy com­munication with the central offices. This task in hospital architecture, seem­ing almost impossible to the mind of the layman, has been accomplished in St. Luke's. The principle upon which it was made possible is that already noted - of placing in the center of a large space a building from the four corners of which should project other buildings, complete in themselves, and at once closely con­nected with and completely isolated from the central structure. St. Luke's is built in what is known as the Renaissance style of the modern French school. Its general appearance is compared to that of the Luxembourg in Paris. The basement is of granite. For the upper stories brick and stone have been used, the brick being, however, of the gray and not the familiar red variety. Within the finish is exceedingly plain, as is proper in a place where never end­ing war is to be waged upon the whole tribe of germs. There are no moldings, no cornices, and no sharp edges or corners. The walls round gently into the ceiling and the floors into the walls. The dust in the corners, dreaded of all good house­keepers, has thus absolutely no chance. The walls and ceilings are of non-absorbent substance. The floors are squares of polished wood laid directly upon concrete, the pores and cracks filled with melted paraffin. The floors and doors are almost the only wooden things in the hospital, the finish of the windows being glazed brick. The arrangements for ventilation, in addition even to those implied in the con­struction of the buildings, are as complete as modern science has devised. During the greater part of the year the windows can be kept open ­which is the best and of course the simplest possible method of ventilation. In distinctly cold weather, it is merely neces­sary to open the inlets of the great ventilat­ing flues, and the building will ventilate itself. In the spring and fall, when­ever the exter­nal air, if admitted through the windows, would create a dangerous draft, fresh air is drawn in at the top of the building, and sent through the hospital by means of propelling fans situated at the bottom of great 'shafts., Once every ten minutes the air is changed. Fresh air warmed or not as desired, may be admitted under the bed of every patient, and the vitiated air drawn off through openings in the ward ceilings. The laundry arrangements are enough to make a good housekeeper grind her teeth with rage at the impossibility of ever equaling them. A special elevator carries soiled linen from the various floors. It is collected from the wards in galvanized iron boxes and is sent by the elevator straight to the soiled linen room in the basement. Thence it passes through the sterilizing room into the rinsing room, thence to a sorting department, thence to the machine, drying, and mangling rooms, thence to a repair department, thence to a separating room, and thence to a distributing elevator. It is a prog­ress which, as will be seen, thwarts the most lively and persistent germ, and ensures absolute cleanliness. In clear weather the final touch of wholesome freshening is given by drying the clothes in the outside air instead of in the dry­ing room. The chapel, very appropriately when approach through the corridor to a short one considers the stress always laid flight of marble steps which lead into the upon the "animam salvare" clause of the motto, is an important part of the struc­ture. Indeed, it is the dominating archi­tectural feature. 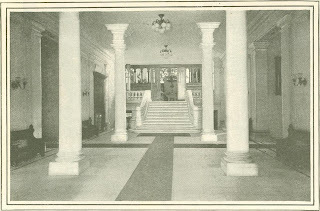 When one enters the building from the broad approach on One Hundred and Thirteenth Street, he finds himself in a stately pillared hall, with other halls radiating east and west from it. There are beautiful columns, large, round, and white, and free from the elaborations of decoration. These form a narrower chapel. Through the open doors the blaze of the chancel window shines down upon the white marble of the altar, through a dim nave, and out into the hall again. The first impression, therefore, which is received on entering the hospital, is that of the open chapel, a little above and beyond the hall around which all the business of the institution is transacted. The prominence thus given to the spiritual side of the hospital's ministrations is in Entire accord with its traditions. It was founded as a church hospital where the sick poor, without distinction of race or creed, might be attended. Dr. William Au­gustus Muhlenberg, rector of the Church of the Holy Communion, was its founder. 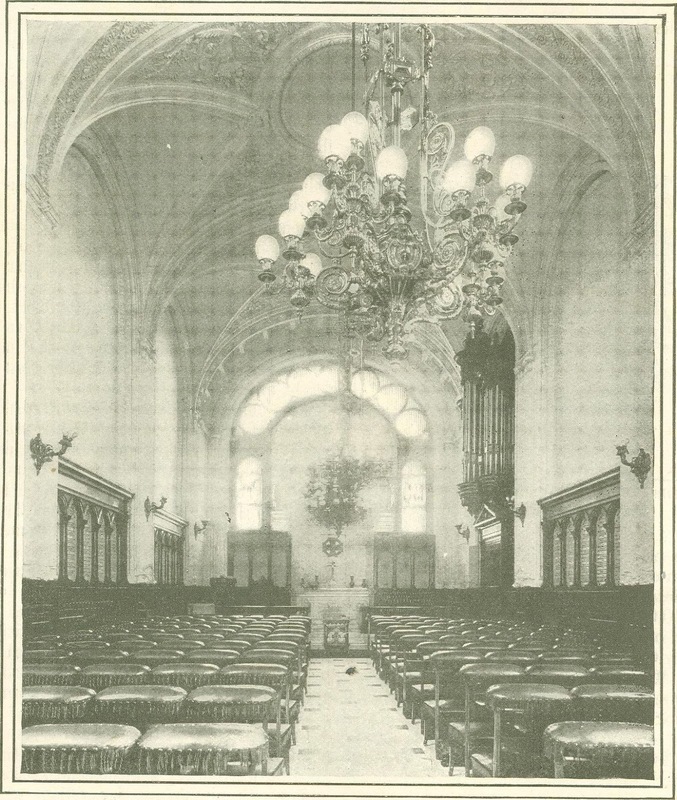 The magnificent building which has just been described, the annual cost of whose maintenance will be from $140,000 to $150,000, grew out of the sum of $15, half of the offertory at the Church of the Holy Communion on St. Luke's Day, 1846. Dr. Muhlenberg devoted that sum to be a nucleus for a hospital to be named in honor of "the beloved physician." Before long one of his parishioners contributed $1,000 to the fund. Dr. Muhlenberg, himself most enthusiastic in furthering his plan, incited enthusiasm among his fol­lowers. 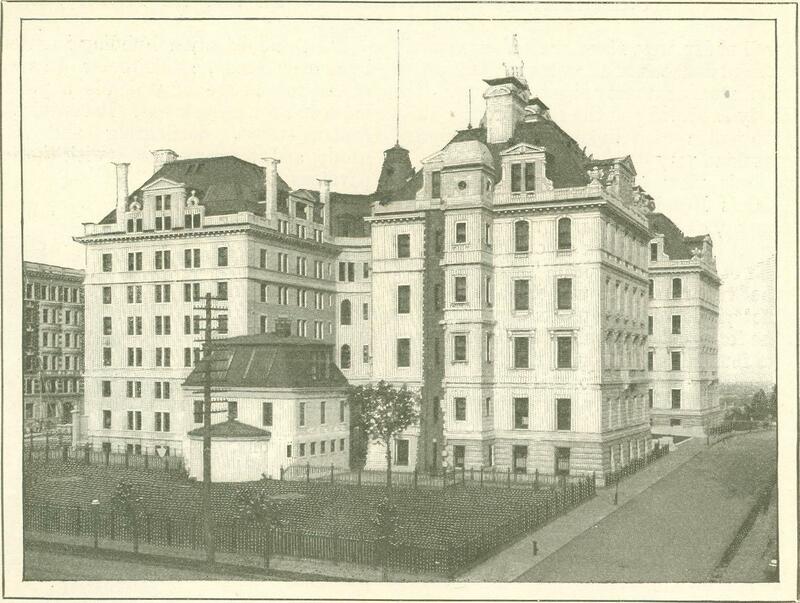 In 1850 the hospital was incorpo­rated. Land at Fifth Avenue and Fifty Fourth Street was secured, and in 1854 the corner stone of St. Luke's was laid. In 1858 the hospital building was really ready for occupancy, and in 1859 Dr. Muhlenberg moved into it, becoming pastor and superintendent, and there he remained until his death in 1877. It is not too much to say, so those who have followed him believe, that his spirit, animating the institution as it did for so many years, gave permanent direction to its tendencies, and that St. Luke's as it stands today is in an unusually real and intimate sense a monument to him. Dr. Muhlenberg believed that the hos­pital should be in every department a prac­tical manifestation of the Christian charity to which appeal was made for its support. It was not enough that doctors, nurses, and medicines were provided for those unable to obtain them for themselves. They must be dispensed in such a way as to give to the hospital's beneficiaries an illustration of Christian courtesy and affection. Patients at St. Luke's, he believed, should be regarded as "guests of the church." As a natural result, the patient was treated neither as free material for scientific experiment nor as an object of institutional charity. The endeavor, both under him and under his successor, the present pastor and superintendent, the Rev. Dr. George S. Baker, has been to secure to the individual patient the same consideration of personal rights that he might expect in his own home. As a church institution - and St. Luke's insists upon this view of itself with a strenuousness rather pleasing in days when it is popular to be religious by stealth - there are daily services held both in the chapel and in the wards. These are, naturally, according to the ritual of the Episcopal Church, but proselyting has not been a feature of the hospital work. The conversion of patients has not been aimed at, but, to quote the historian of St. Luke's, the building up "of faith in individual souls, by personal ministration, by the daily services of worship, and by the simple presentation of the essential truths of Christianity." Creed has absolutely no place in the admission of patients. The doors of the hospital have never been closed to suitable and needy applicants for relief whose diseases were acute, curable, and non-con­tagious. Statistics kept from the open­ing of the hospital until 1892 show that of 36,050 patients treated during that time only 38 1/2 per cent were Episcopalians, while 33 per cent were members of other Protestant denominations, 271 were Roman Catholics, and 1 per cent Hebrews. 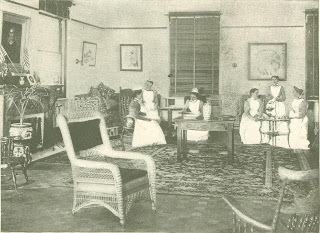 One of the most interesting features of the hospital is the training school for nurses under the direction of Mrs. Quin­tard. There are seventy one young wom­en now in the school, which was started in 1888. Their appearance is all that the most inveterate reader of sentimental war stories could desire. They wear the neatest and prettiest uniform of blue and white striped gingham. Their bibbed white aprons, their neckbands of stiff linen, their crisply erect and airily poised little caps of sheer white mull make altogether a composite of exquisite order­liness which must at once inspire hopeful convictions in the hearts of their patients. It is impossible to conceive of anything so manifestly out of place as disease daring to persist near them. In every ward there are a head nurse and her assistants. The head nurse may be recognized by the black velvet band upon her cap, if no other marks of author­ity are about her. It is she who sits at a little writing table in the cen­ter of the ward, and writes out re­ports and makes requisitions. It is she who in solemn state accompanies the doctors through the ward on their daily rounds. It is she who receives instructions, trans­mits orders, and is responsible for the im­maculate neatness of the ward and the efficiency of the nurses under her. The Nurses' Home is in the Vanderbilt Pavilion. It has a private entrance on One Hundred and Fourteenth Street, and is altogether a charming place. Archi­tecturally it is like the rest of the hospital. 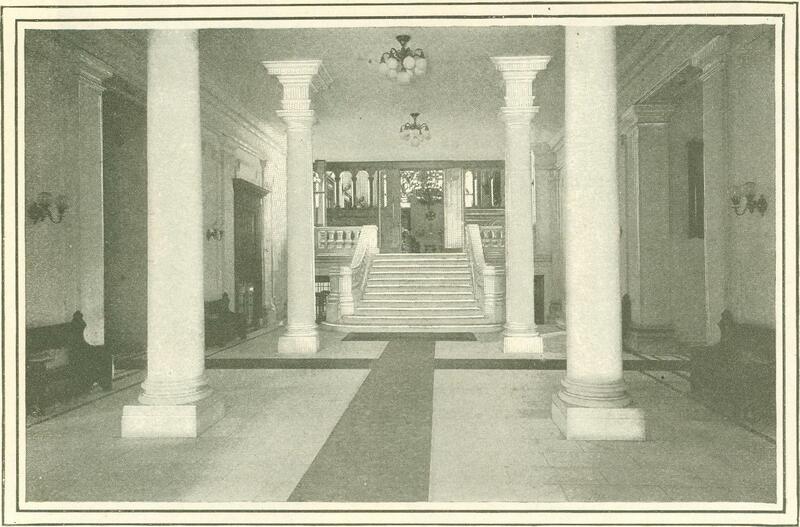 It has the same walls, floors, and columns. 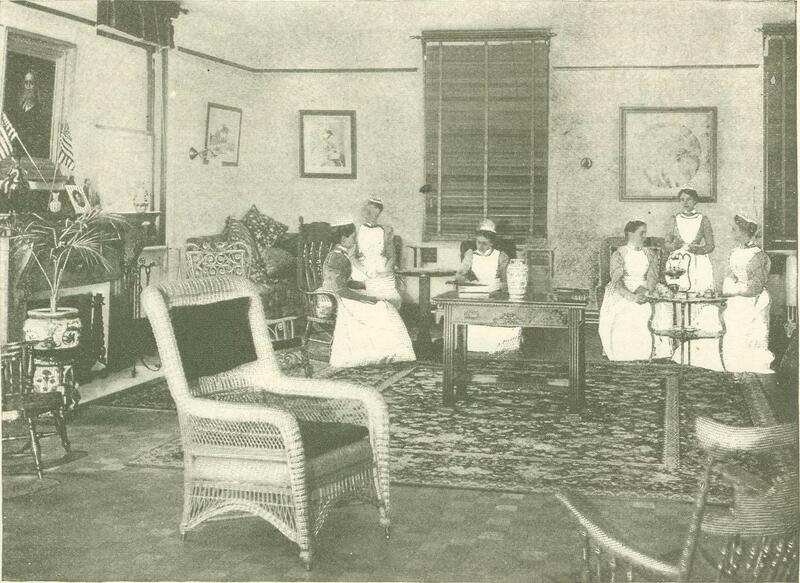 The parlor is an enormous, sunny room where desks, bookcases, couches with many pillows, easy chairs, and a tea table invite the nurses to many agreeable forms of rest or diversion. They have, however, comparatively little time for diversion. Their working day lasts for eleven hours, including nine hours of actual work and two of leisure. They have an afternoon off every other week. Their work is so largely physical, requir­ing a great deal of standing, walking, and moving about, that until they become accustomed to it, the time which they have free each day is devoted to rest. Their bedrooms are charmingly arranged around the four sides of their pavilion, on the floors above the first. St. Luke's is in itself quite a large community. There are the family of Dr. Baker, the family of his assistant, the Rev George F. Clover; the chaplain, the Rev. Charles E. Freeman; the cashier, the head of the nursing department, the head of the housekeeping department, the apothecary, the seventy one nurses, ten house physicians, one hundred and twenty five servants, and, in full seasons, as many as three hundred free patients. Provision is also made for private patients. Their pavilion will accommodate about thirty six. The rooms are arranged so that they may be thrown into suites, each having a private bathroom attached. In the wards there is a remarkable air of cheerfulness, entirely at variance with the accepted notion of sick rooms, and especially of free hospitals. This is partly due to the brilliantly sunny effect given by the white walls, the light polished floors, the white pillars, the white iron beds, and the long rows of windows on all sides. 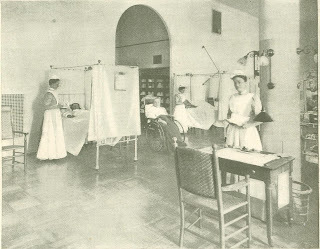 Down the middle of the wards are objects that add to the cheerful glitter - here a table, neat as the proverbial wax, where the head nurse sits to do her writing; there a "dressing car" of white enam­eled ware, hold­ing shining bot­tles and jars all ready to be wheel­ed wherever they are needed. 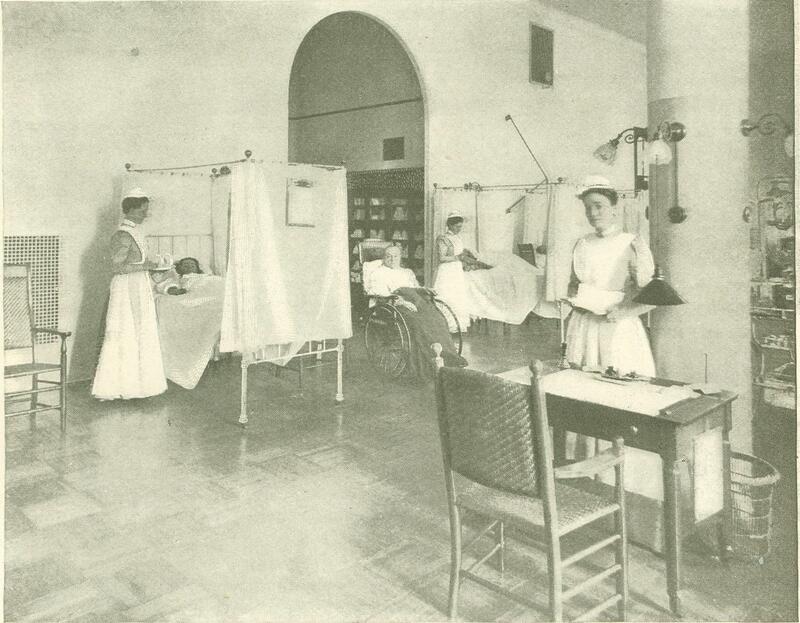 In the women's wards white curtains around the beds, and white screens at the side or foot, add to the crisply cheerful aspect of the place. Beside each bed is a big chair in which the convalescents may sit for a while each day. It is in the children's wards, however, that hospital life is seen in its most charming guise. These occupy the upper stories of the Administration Building, and they look out in front toward the greenery surrounding the unfinished cathedral. In them is not only the customary array of white beds and glitter­ing hospital apparatus, but here is a bowl of gold fish moving languidly about in crystal clear water, and there is a marble statue of a child, perfect from her childish forehead to her little feet, the very incar­nation of sweetness and health. Here a toy stove stands upon a broad window sill, and there a doll sits pertly erect in a wheel chair an hour ago, perhaps, a child lay lan­guidly. Here is a crutch against the foot of a bed, interpreter of the suffering of the child who sleeps in it. There a mere baby lies and stares about with round, wise eyes and plays with the pink heel of her foot as solemn and as all absorbed as if no bandage bound her head and no pain lay behind her or before her. The happy confidence with which these children smile upon all who enter their wards, the bright­ness and the friendliness of their looks, tell more than many volumes of the work­ing of the theory on which Dr. Muhlenberg long ago built the hospital. Not only are their sufferings made light, their pains allayed by all the devices known to modern medical science, but tenderness has come also and grown so constant a companion to them that, childishly, they are confident of it from all who enter the place where they are. And seeing how, no matter what the whiteness of their faces, no matter what the bandages that bind them, they beam welcomingly upon the visitor, one is moved to believe that in all the wonderful building there is no monument to the success of Dr. Muhlenberg's conception so convincing and so beautiful as that smile upon the faces of the children whom his dream, grown a reality, shelters and cures. Originally published in Munsey’s Magazine. January 1900.